Family Road Trips: Time Together that Breaks and Bonds – Travel. Garden. Eat. As parents before us always cautioned, “Time goes so fast, enjoy it before it’s gone.” Words of wisdom, and words we tried to heed in between those other moments when every parent feels that a little alone time would not be so bad? So it goes with the family road trip. My recent travel consisted of acting as a companion to my son as he visited universities in Boston and Washington, D.C., while my husband and other son held down the fort at home with the four-legged family members. As my oldest son and I traveled together for the week, I was struck with the thought that our days of the week-long family road trip are probably over – the boys’ summer activities, social life and work schedules increasingly interfered with trying to schedule family time this past summer, and in not much longer than a year from now, we will see our oldest off to college. Time does go fast. 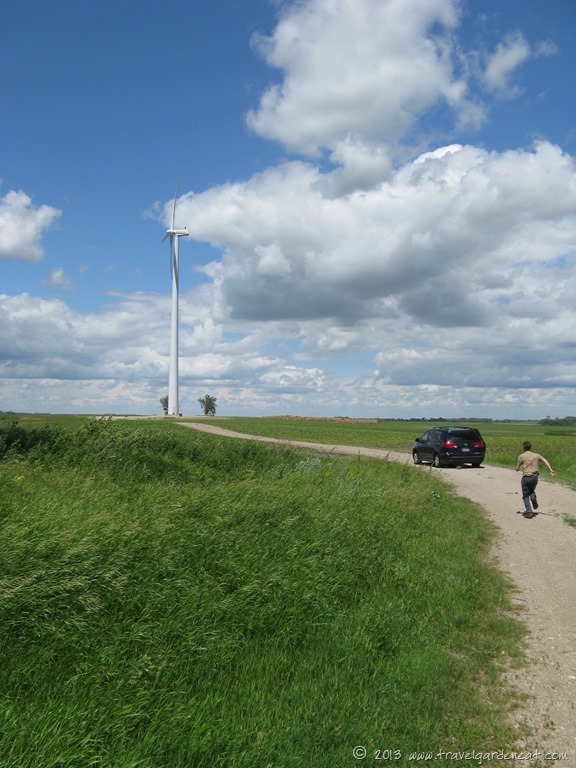 Running back to the car while geocaching alongside the highway, before mom threatens to drive off . 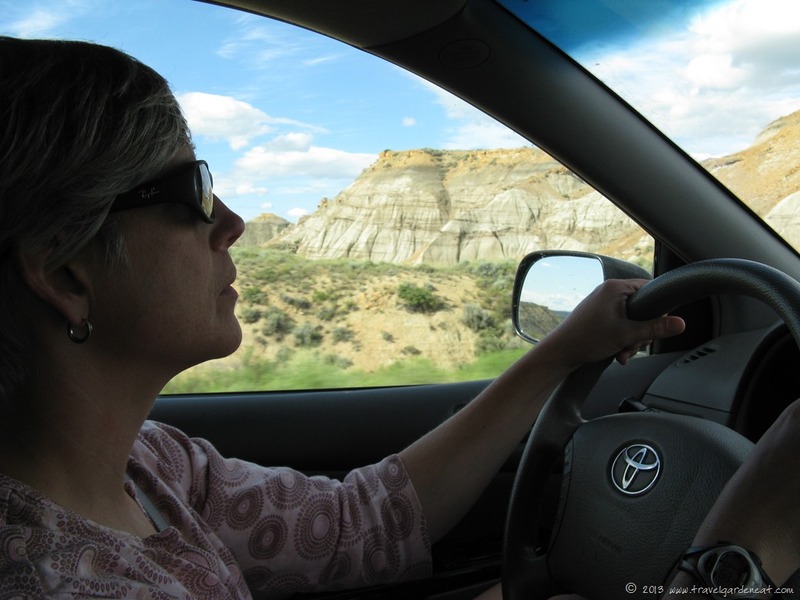 . .
Our family’s road trips over the years are full of memories — the good, the bad and the ugly. 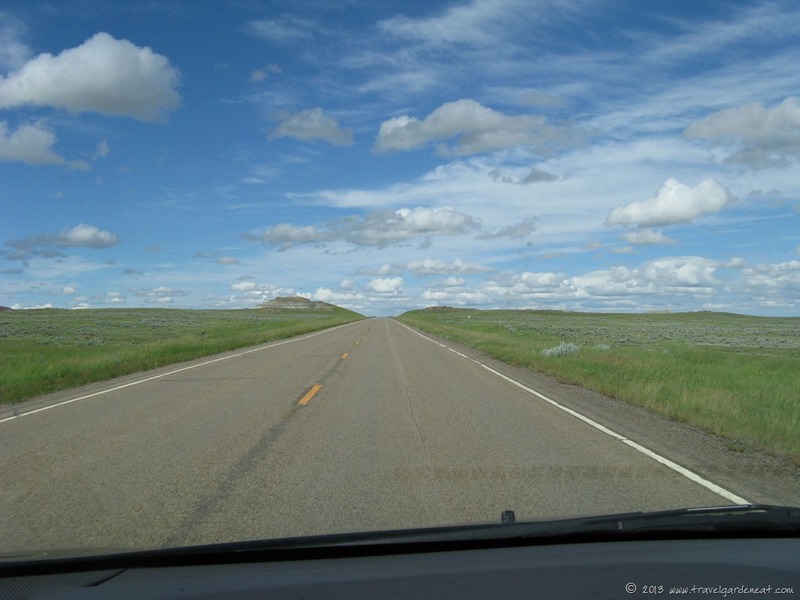 So it goes when spending 24/7 together in a car, in a tent, in a small rustic room of lodging, on the trail, in the heat, in the cold . . . .
Road-tripping across North Dakota and Montana — endless fields, endless skies. 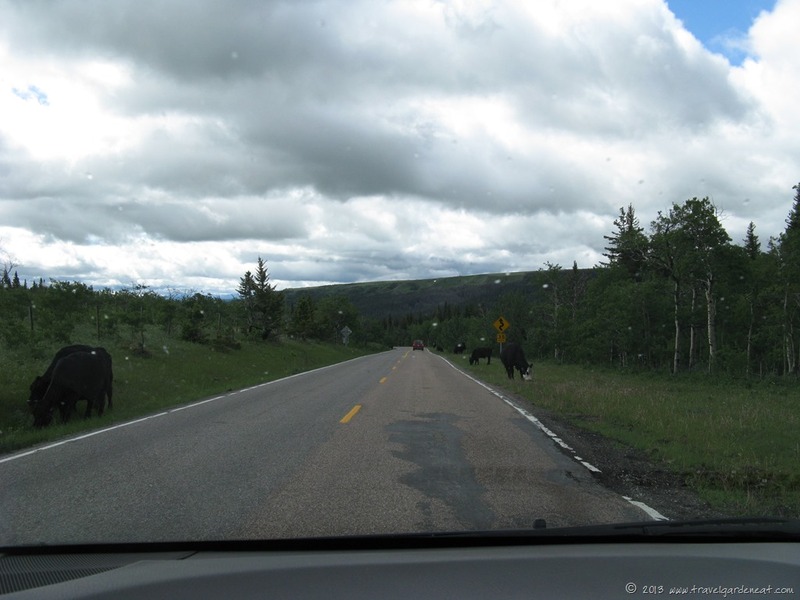 Our road trip a few summers ago to Glacier National Park in Montana involved the long drive across Minnesota, North Dakota and Montana to reach that stunning northwestern Montana scenery. 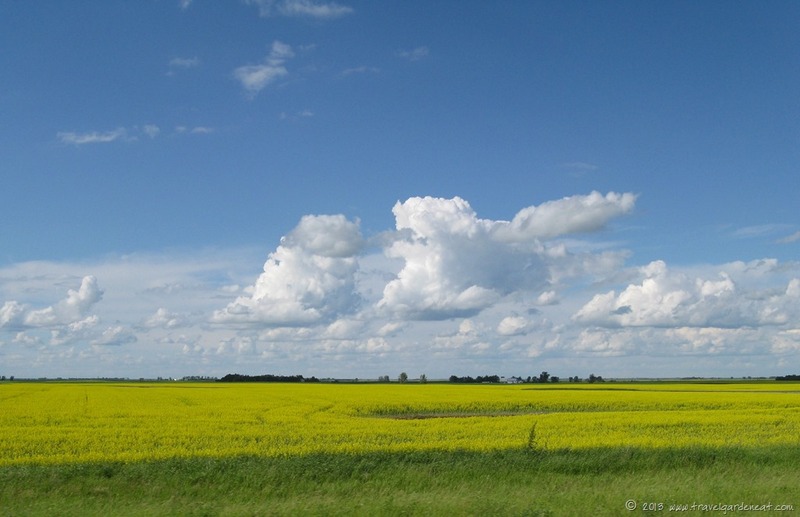 But don’t knock the scenery in between — the prairie land of North Dakota, the endless yellow canola fields of Montana, the miles and miles of blue sky in all directions, and the wildlife along the way. “Look, there’s buffalo!” OK, so the lighting was off, and they are free-range cattle instead . . .
After several days of exploring Glacier National Park’s trails and the surrounding area (I shared one stunning example with you in this post on the Iceberg Lake trail), it was time to reverse the road trip and head back home to Minnesota. “Gum guy” ended up in “time out” status on the dashboard before his reign was complete. He was the creation of my oldest son. We are pretty sure that gum guy’s sole purpose on earth was to torture my youngest son. I will say that gum guy left us in stitches before he was confiscated, as he had some witty one-liners in between his aggravating antics. Seriously, though, when I think of the countryside we have explored by car together, sometimes traveling for hours by interstate, but often taking that road less traveled to see the nooks and crannies of the scenic side roads, I am grateful. I hope my boys will be, too, as they look back years from now. Road tripping provides opportunity to stop and appreciate the wonder of a changing landscape. As one example of many from our road trip travels, we approached our stopping point for the night on the western border of North Dakota. Storm clouds moved in and let loose some heavy rain for a time. The clouds were still dark and heavy when the sun broke through on the horizon behind us. The result was the most rewarding scene for miles — a rainbow which blossomed into a double rainbow, so breathtaking in its beauty that it even had two adolescent boys exclaiming in awe! Never have we seen a rainbow so vibrant, so large. We pulled the car over to a scenic overlook spot along the highway to enjoy nature’s special show. 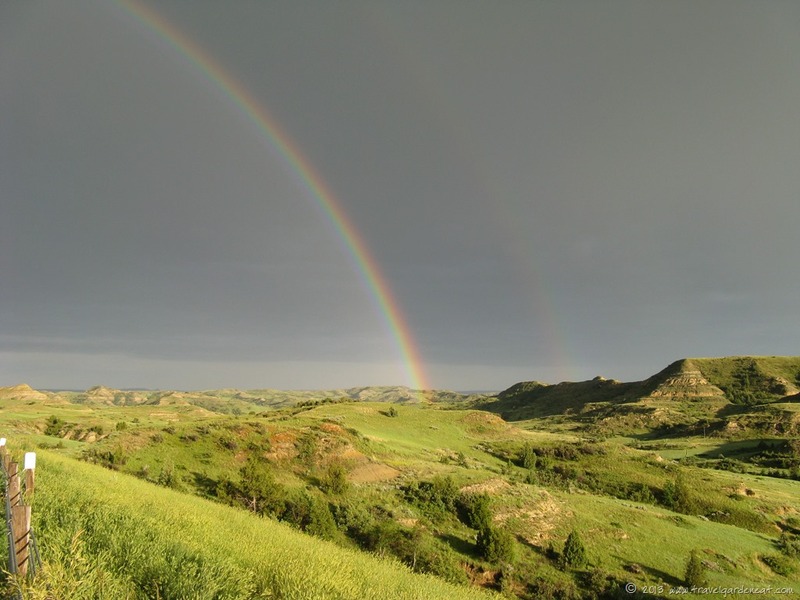 The sight left us believing that if we ran across that rugged landscape we would be certain to find that pot of gold at the end of the rainbow. As the sun began to set, the rainbows faded. My oldest son had discovered a geocache was located nearby; I called out for him to return to the car so we could finish our journey for the day. 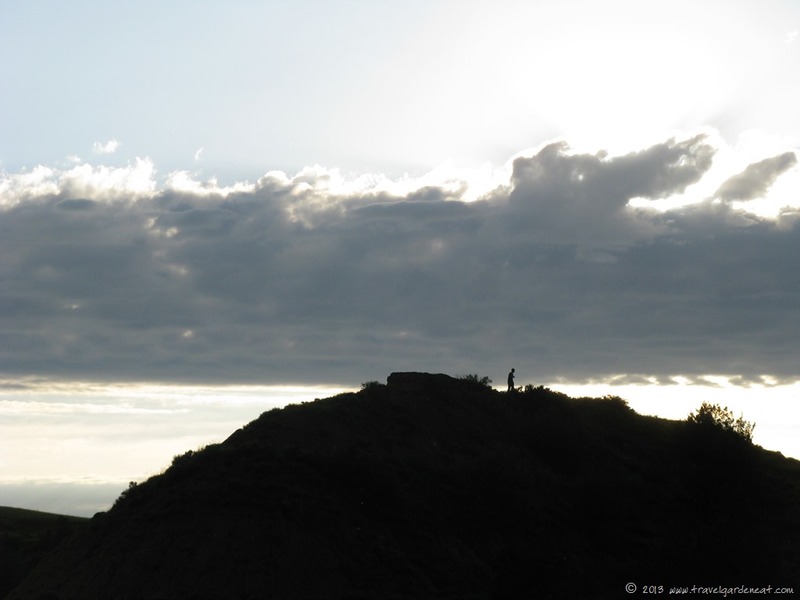 When he shouted back to me, I turned to see his silhouette atop of one of the buttes, making his way back to the car. Our trips to the big cities have been exciting, full of interesting museums, historical sites, eclectic food, sometimes posh lodging. But our road trips in various directions across this diverse landscape of the United States have held memories you cannot create by buying a ticket or making a reservation. I love family road trips. We’ve been going up to Canada every year and a couple of years ago, we did a 13 state loop, visiting the Grand Canyon and Mt. Rushmore. I’m looking forward to planning our next one! Had hoped to get to the Grand Canyon on one of ours, but haven’t gotten there yet –the bucket list never ends! Thanks for sharing Kat, very interesting to me who didn’t grow up in the great tradition of long family road trips! I remember as a young girl our one or two week long camping trips, with my sister and I sitting in the back of the station wagon for hours at a time, no seat belts of course during those years, holding up signs to cars and trucks passing by, trying to get the semi trucks to honk their horns. And I remember driving on Needles highway with you looking green!! We thoroughly enjoyed our first big road trip last summer and look forward to a few more before Z gets into the busy age of your boys! It was the flu, though, not just car sickness! I remember that trip for discovering the Anne of Green Gables series as you all abandoned me in the tent and went off hiking while I hunkered down with my queasy stomach and a pile o’ books. We live in a finite timeline, but our memories are forever. I remember family trips as a child and now I can celebrate the moments that my husband and I shared with our son as we travelled the world. It was never the place, it was the adventure. Even a trip of a few miles creates a story. Thank you so much for this life affirming post. You have captured the essence of family and community. Wonderful pictures; wonderful memories. Our son is 26 now, and although we didn’t travel much, I dragged him along on many “old-people bus tours” with my mother. It warms my heart to hear him talk (now) about how much fun he had on those trips. We made some pretty great memories of our own. I haven’t been to a long road trip and today, you made me wish that I did. Love this one, “Our family’s road trips over the years are full of memories — the good, the bad and the ugly.” Travelling is a combination of all these but in the end, we can say we are glad that we did it. I cherished the road trips me and my sisters had with our parents growing up and one day I hope t share the same with my son. Thanks. I know you will share the same with your son some day! Love the post. It reminds me of my family road trips with 6 of us packed into the proverbial station wagon …. none of the kids strapped in in the back 🙂 Pushing each others buttons, parents trying to cope, and yet the memories I have are all amazing. Beautiful scenery, time spent together wihen no one was plugged into something, etc. Thanks for bringing back memories!! Isn’t that the truth? Being plugged in removes some of that connectivity that road trips are supposed to bring! Of course, that also can bring “the ugly” — I had sworn I would not cave into the travel DVD player when the boys were young but after we listened to by then year-old youngest fuss, cry and scream for about 12 hours out of a 15 hour road trip over two days, the DVD player allowed us many more road trips in those early years than we could otherwise have enjoyed! Boy, with 6 in the station wagon, it’s harder to draw those invisible territory lines that the sibling is not supposed to cross! “Gum Guy” brought to mind my favorite road trip memory with “Seymour Butts” a little plastic toy that we put in the back window, and when you pushed a button he would drop his pants and moon other drivers. My sister and I were in hysterics (and no, we weren’t children at the time – we were grown adults being this silly!) Best road trip ever!! Wonderful road trip. It was a great joy to me making the same trip thru Your wonderful photos – I enjoyed it. Thank you for traveling with me, Sartenada! I would have no objection to making periodic visits to Boston over the years! It is a great city. Beautiful post on the joys of family life. We have done several road trips with our sons too. We live in Seattle and have done many trips down the Oregon Coast into California and all the way to Southern CA. I love that drive. We have also done separate trips to Yellowstone, Salt Lake City, and numerous smaller trips. I have to say the cars on the hwys seem less now than when I was younger taking these trips with my parents. It could be gas is so expensive. I don’t know. That Oregon Coast drive has always been a road trip I have wanted to do! Your family memories will last a lifetime and I know you treasure them. The memories definitely will last a lifetime — the good, the bad and the ugly 🙂 — it is fun to look back and reflect. Great picture of that double rainbow! I was so happy to be able to capture that view to enjoy again in the future! Thanks! Smiling broadly at “gum guy”. 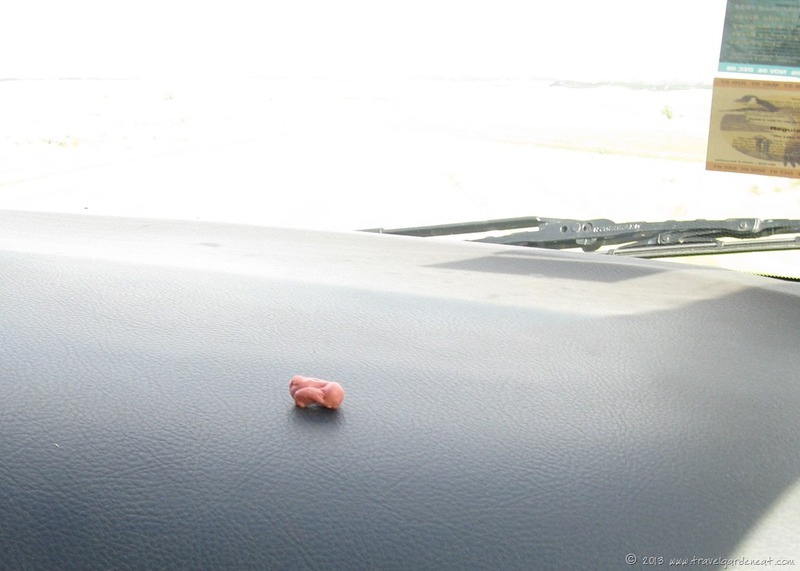 I have been known to leave gum on the dashboard. Please do not tell. You had me thinking about our good, bad and ugly travel times as a family. Mostly good, but you know how life sprinkles in the other, too. Loving the rainbow. A perfect symbol of what stretches above it all. The dashboard can be such a convenient storage spot — however, in our case, “gum guy” needed a stockade.